Packers wide receiver Randall Cobb (18) runs onto the field prior to the game against the Baltimore Ravens at M&T Bank Stadium. GREEN BAY, Wis. — For the first time since Randall Cobb suffered a fractured tibia on Oct. 13, the Green Bay Packers received some good news on their injured star receiver. 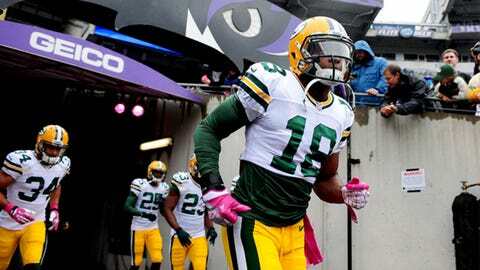 "Randall Cobb’s workout today I was told today was very good," coach Mike McCarthy said Monday. "He’s moving. Everything looks good. We’ll see how he is (on Tuesday). Wednesday is really kind of the day that we set the plan for all the players." Cobb was eligible to be taken off of injured reserve (he was given the team’s designation to return) before the Packers’ game Sunday at Dallas. However, he has still not been medically cleared. Cobb, 23, led Green Bay in catches and receiving yards last season. In just the five games this season prior to his injury, Cobb already had 29 catches for 378 yards and was on pace to exceed his 2012 production. Cobb has not practiced since the injury, so it seems unlikely that he’d play this weekend against the Pittsburgh Steelers. But, if the Packers are still alive in the playoff race when they travel to Chicago in Week 17 for what could be a win-and-they’re-in game, Green Bay would certainly like to have Cobb available. If Cobb is brought back onto the active roster yet this season, the Packers would have to clear a roster spot for him.